This is Part 2 in a series of conversations with scholars in the F. A. Hayek Program for Advanced Study in Philosophy, Politics, and Economics. The first installment was a conversation about Austrian economics with Chris Coyne, Associate Professor of Economics at George Mason University and Associate Director of the F. A. Hayek Program. Read Part 1 here. In this installment, I am joined by Don Boudreaux, Professor of Economics at George Mason University, Senior Fellow in the F. A. Hayek Program, and prolific contributor to the popular economics blog Cafe Hayek. 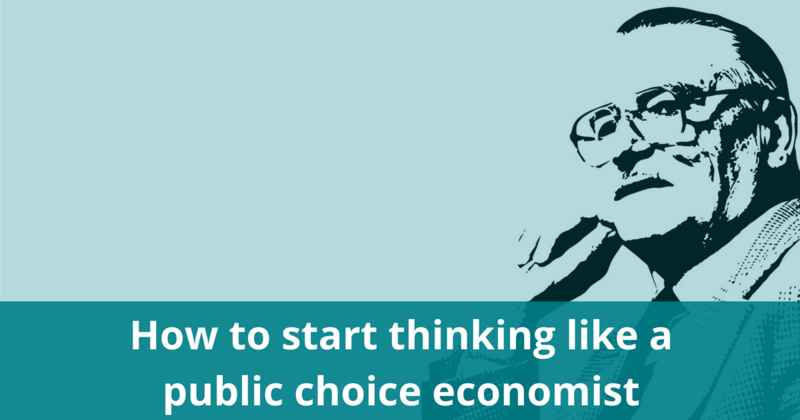 In this conversation, Don and I discuss public choice economics and its relevance for past and present research in political economy. The core insight of public choice economics is that all people respond to incentives… even politicians. And judges, and regulators, and the chairman of the PTA, and the president, and the pope, and so on. I recognize the statement may seem a little obvious, but I don’t mean it flippantly. Few disagree with the statement that “all people respond to incentives” when thinking about buyers and sellers in the marketplace, but there is a long tradition of scholarship that presumes political leaders and civil servants to be the folks who rise above the fray. The uniqueness of the public choice insight is in how much understanding can be gained from instead treating actors in political systems as if they have the same knowledge and moral compass as the rest of us. In the following video, Don Boudreaux describes this perspective as “politics without romance” (a phrase also used by Nobel laureate James M. Buchanan). This idea is operationalized in public choice scholarship by holding foundational assumptions about how people behave constant across institutional systems. Are people fundamentally kind, generous, and wise, or are they cruel, self-absorbed, and foolish? According to public choice scholars, your answer to this question should be essentially the same whether you are thinking about people in their economic, social, or political roles. This requires jettisoning the stereotypes of the greedy Wall Street executive and the selfless civil servant. There is also no room in public choice for the face-off between the honorable entrepreneur and the corrupt politician. Both are analytic imbalances that must go — for a couple important reasons. First, the idea that some people are economic actors and others are political actors is a myth. The reality is that most of us, if not all, participate in both markets and politics on a regular basis. People who earn a living in the private sector still vote, express political opinions, join neighborhood associations, and may even run for school board, the city council, or the state legislature. People whose paychecks are signed by governmental organizations still buy, sell, and invest, and they may even drive for Uber or run a business in addition to their day job. There is no “economic man” and no “political man” — each of us contains both. Assuming that economic and political actors are fundamentally different in character is tantamount to claiming that each of us is a kind of Dr. Jekyll and Mr. Hyde, with our better or worse nature taking over depending on where we happen to be standing at the moment. Second, to the extent that different groups of people do seem to behave in fundamentally different ways, these are facts that require explanation — not appropriate starting points for analysis. Imagine, for example, you want to compare the actions of Mr. G and Ms. M. If you assume they are both reasonable people who respond to particular rules, rewards, and nudges in roughly similar ways, it becomes possible to understand how their behavior is shaped by the incentives of the system they are operating within. If, however, Mr. G is presumed to be kinder and wiser than Ms. M, with a better nature that always triumphs, then there’s no more use in asking why Mr. G and Ms. M behave differently. We already have our answer — it is because of Mr. G’s inherent greatness. In this scenario, social science is almost useless. However, if assumptions about how people act are held roughly constant across political and economic systems, then meaningful comparison between alternative institutional arrangements is possible. Whether or not you buy this argument, there’s no reason to take my word for it. Public choice logic is constantly on display in the world around us. Don gives a few examples in the video above, including that of antitrust legislation, a subject he’s researched and spoken about before. Once your eyes are opened to public choice, it’s hard not to see a new example every time you turn on the news. Once you put on your public choice glasses, it’s all too easy to see how the reasonable actions of reasonable people can result in strange — even perverse — consequences if those individuals are faced with the wrong incentives. But my take here is only the beginning of the public choice story. If you share my fascination with these ideas, you can listen to my full conversation with Don below and sign up to be notified when future conversations are posted here. Subscribe to the Hayek Program Podcast at Soundcloud, iTunes, Stitcher, and Google Play. If you’d like to take a step further, you can read here about the fellowships and other opportunities available to study public choice economics and other core ideas in political economy through the Mercatus Center.